I do like Asus products lately. Great Chromebooks and laptops. ... if it's anything like the 14 it'll be a winner. It looks packed to the gills with top end specs in a slimline build. Plus, it'll use USB-C for charging! S must stand for 'super'. Now, the announcement is for the American stores but hopefully, we'll have details about the Canadian launch soon. Fremont, California (April 15, 2019) — The ASUS ZenBook S13 (UX392) is available today. A true combination of beauty and power, this ultraportable delivers performance and portability into an impossibly small chassis. Its 13.9-inch FHD frameless four-sided NanoEdge display is the most impressive to date, featuring the world's slimmest bezels and 97% screen-to-body ratio¹, the largest of the industry. With NVIDIA® GeForce® MX150 discrete graphics, and the latest 8th Gen Intel® Core™ quad-core processor, ZenBook S13 pushes the boundaries of what’s possible inside a 13-inch chassis. There’s ample space with 512GB of PCIe® x4 SSD storage, and the 50Wh battery provides up to 15 hours of battery life². ZenBook S13 takes narrow bezels to the extreme with a 13.9-inch FHD display, surrounded by the impressive four-sided ASUS NanoEdge bezels that deliver the industry’s biggest screen-to-body ratio at 97%. A 2.5mm border frame the sides of the display. The thickest upper bezel accommodates the HD webcam, and also serves as a tab for lifting the laptop’s lid. Finding the tab on the lid is easier this way, allowing the user to pull the lid up in one smooth motion rather than searching for a barely-there indent on the front edge. It’s a small change that makes all the difference for day-to-day use, and was worth the effort of changing the shape of the glass on the display and altering the design of the laptop’s lid. Despite the larger display, ZenBook S13 manages to retain a smaller physical footprint (316 x 195 x 12.9mm) compared to most 13-inch laptops. Intel’s 8th Generation of mobile processors have been a staple for the ZenBook series for over a year, and ZenBook S13 takes this step further with up to the latest 8th generation Core i7 CPU paired with up to 16GB of RAM. The Core i7 configuration benefits from four cores and eight threads for smooth performance, allowing for complex workloads, like video encoding, or aggressive multitasking, like processing photos while switching between productivity apps, emails and web browsing. Processing performance is paired with upgraded graphics capabilities made possible by the NVIDIA GeForce MX150. To get the most out of the CPU and GPU, ample storage is required. With ZenBook S13, large media files and burgeoning PowerPoint decks don’t have to vie for space or face cold cloud storage when installing new applications because up to a 512GB PCIe x4 SSD maxes out ZenBook S13 on storage speed and capacity. Squeezing more components into the same 12.9-mm thick package as the first ZenBook S required a bit of ingenuity from the ASUS engineering team. To ensure no space was wasted, the metal chassis is CNC-milled from a block of aluminum, allowing the lid to be carved out, complete with the complex cuts surrounding the keyboard, without creating any unnecessary voids. Machining allows the walls to remain thinner while still leaving enough material in key areas to avoid sacrificing strength, and shaving thickness in any area means more room for the components. 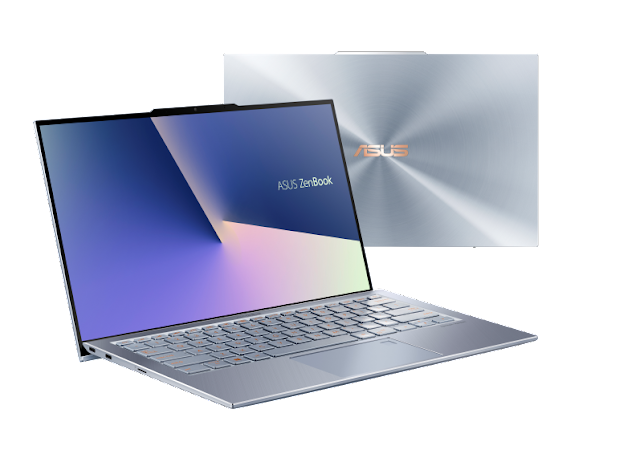 The ZenBook series always epitomizes ASUS’s dedication to laptop design, and is built on the premise that the finest ultraportables are a blend of style and power; refining the definition of the ultimate ultraportable. ZenBook S13 once again pushes the boundaries of design to deliver a truly portable, thin and light laptop without sacrificing performance and resistance. It also meets the demanding MIL-STD 810G military standards for durability, being torture-tested in harsh environments including extremes of altitude, humidity and temperature. One of the most striking changes for the ZenBook S13 is its visual appearance. It now comes in trendy Utopia Blue, a totally new hue. The subtle silvery blue makes it stand out, while the paler color shows off the signature concentric Zen ripples on the lid beautifully. Utopia Blue offsets the Rose Gold accents and diamond-cut edges for an added touch of elegance. Despite its compact dimensions, nothing about ZenBook S13 feels cramped. The backlit keyboard spans almost the full width of the laptop. And while ultraportable keyboards are often shallower because of their slim design, ZenBook S13 actually features a slightly longer 1.4mm of travel than its predecessor. Underneath is a roomy touchpad with an integrated fingerprint sensor that makes for quick and convenient login via Windows Hello. With no compromises on connections, ZenBook S13 offers the convenience of standard USB 3.1 Gen 2 Type-A port on the side. Lots of super slim laptops only provide USB Type-C™ (USB-C™) ports, making this connection type a rarity, but it’s extremely useful for plugging in USB drives along with other peripherals that haven’t yet made the jump to the more modern USB-C. In addition to its standard USB port, ZenBook S13 has two USB 3.1 Gen 2 Type-C™ ports, with up to 10Gbps of peak interface bandwidth4. Either can be used to hook up to an external display or charge up the battery. The 50Wh battery is enough to provide up to 15 hours of use, and if need be, fast charging brings support for powering up quickly on the go. The USB ports are joined by a 3.5-mm audio combo jack allowing utilization of any choice of headset, and a MicroSD card slot is provided for quickly pulling photos and videos off of a variety of devices. 1As of January 7, 2019, based on internal ASUS market analysis comparing screen-to-body ratio and width of ZenBook S13 side bezel with competing products from vendors including Acer, Apple, HP, Huawei, Lenovo, Microsoft and Samsung. The stated 2.5mm width of the side bezel is the distance between the edge of the non-active screen display area and the inside edge of the case. If the case width is included, the side bezel width is 3.5mm. The stated 3.6mm of the top bezel does not include the camera housing: at the camera location the bezel width is 5.9mm. Measured based on standard (not anti-glare) display configuration. 2Battery life test configuration: Intel® Core™ i5-8265U, 8GB RAM, FHD display, 256GB PCIe® SSD. Battery tests conducted by ASUS in November 2018 using the MobileMark® 2014 Office Productivity scenario. Test settings: Wi-Fi enabled, display brightness set to 150cd/m2. Actual battery life may vary depending on product configuration, usage, operational conditions and power management settings. Battery life will decrease over the lifetime of the battery. 3As of January 7, 2019 based on internal ASUS market analysis of laptops with the following key competitive criteria: Windows or OS X operating system; thickness measured at z-height excluding the rubber feet; Intel® Core™ processor; non-detachable keyboard. 4Unless otherwise specified, performance figures refer to theoretical performance. Actual performance may vary. The ASUS ZenBook S13 with 8GB memory (UX392FN-XS71) is available now for $1399 MSRP at ASUS, Amazon,Newegg, and Walmart online. The ASUS ZenBook S13 with 16GB memory (UX392FN-XS77) will be available at Micro Center for $1499 MSRP. For additional information about ZenBook S13, please visit http://www.asus.com/Laptops/ASUS-ZenBook-S13-UX392FN/ or read the article on ASUS Edge Up.